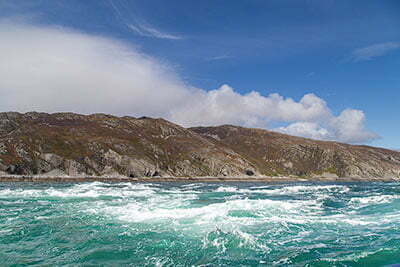 In the north of the Isle of Jura, between the Isle of Scarba and Jura, is the Corryvreckan Whirlpool. Corryvreckan is the third largest of these natural phenomenons and can be a spectacular sight to see. The dangerous currents, standing waves and sudden calm waters between the two islands of Jura and Scarba usually appear around the changing of the tides, and most of all during spring tide. These effects are caused when in and outgoing tides enter the narrow strait between the two islands while being pushed up and down by deep waters of around 150 to 250 metres with a pinnacle in the middle which rises up to 30 metres below the surface. The Corryvreckan whirlpool is in fact the third largest, or second largest according to some, in the world, and only experienced skippers are able to navigate these waters during tidal changes. Visiting Corryvreckan is a must, trust me. Although Corryvreckan is in the north of Jura it can still be quite an undertaking to visit it as there is no road going there. If you do want to make it on foot you’ll have to drive or take a bus to the end of the “Long Road“, the one road on Jura, to “Road End”, around half a mile after Lealt, where you’ll find a small car park and, a wee bit further, a chain over the road with padlock. From here on it’s a long walk to reach the north of Jura. The nearest cottage is Barnhill, which is 4 miles, Kinuachdrachd is 5 miles and Corryvreckan itself is a 7 mile walk. If this is too far, and it probably is for most, you might want to arrange 4-wheel drive transportation with one of the estates or ask Alex for advice. Lately another company has started to offer trips to Corryvreckan. It’s Islay Sea Adventures and they offer Corryvreckan trips from Port Askaig. Port Askaig is within easy reach of Craighouse. All you need to do is drive down to Feolin or take a bus or bike and cross the Sound of Islay on the Jura Ferry. From Port Askaig you sail up the Sound of Islay and along the very fascinating west coast of Jura to the Corryvreckan Whirlpool. The folk from Islay Sea Adventures are very knowledgeable and will also point out the wildlife along the way. Sightings of Golden Eagles or Sea Eagles occur very frequently. Booking is advised. For more information on the Corryvreckan Tours visit this link or you can either call Gus on 01496 300 129, or send an email to info@islay-sea-adventures.co.uk. Thanks very much for that information and photographs. I would like to hear from you more often. On Oct1st 2016 i was privileged to capture images of 2 of the Paps of Jura from here on the north coast of Ireland. It was a wonderful experience for me. Ron, Wondering how to get in touch with the estates to arrange for a look at Corryvreckan. We’re not too much for adventurous boat trips and would rather see it by land anyway. Alex doesn’t seem to be answering emails. Ron, we’d like to hike from Long road to see the Corryvreckan whirpool. Can you tell me how long the hike will take?